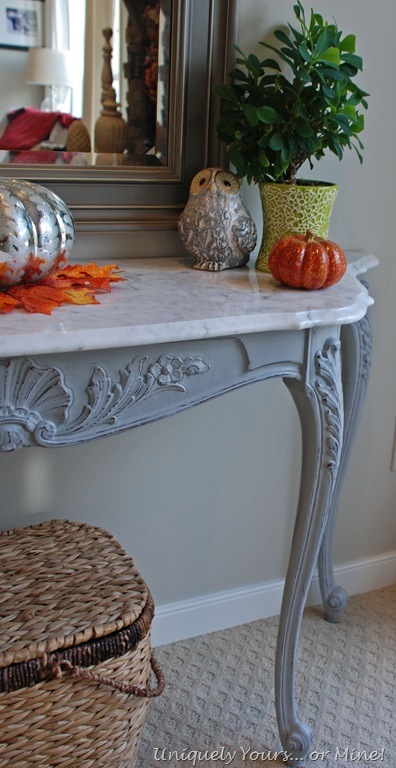 Carrera Marble Topped Console Table – Uniquely Yours… or Mine! I won this little pretty at an auction several months ago… The shape is PERFECT, the marble is authentic Italian Carrera and is in fantastic condition but the color of the wood base had to be changed! 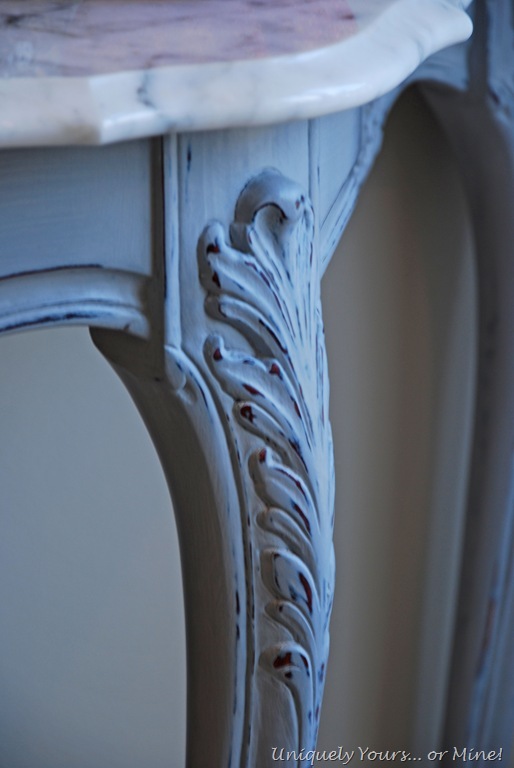 I did prime this with grey spray primer prior to painting… I always play it safe when working with mahogany as the bleed through can be a pain in the rear! Here it is all decked up for Fall! 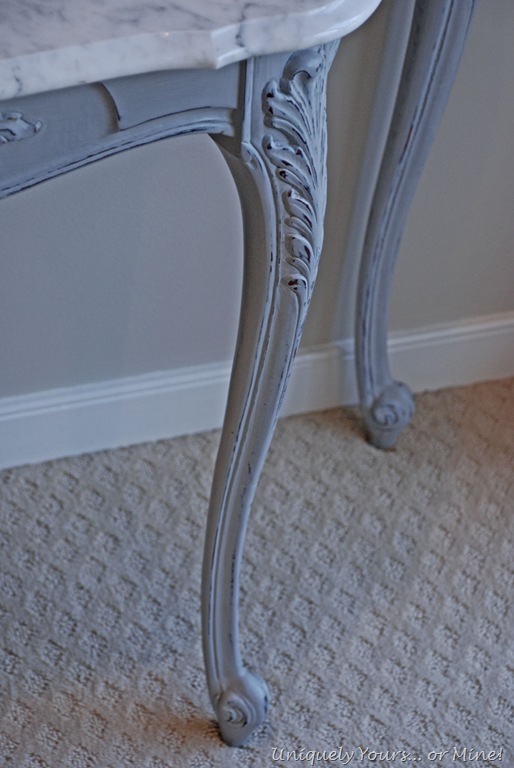 I painted it in Paris Grey Annie Sloan Chalk Paint, lightly distressed it and waxed it with a coat of clear soft wax. 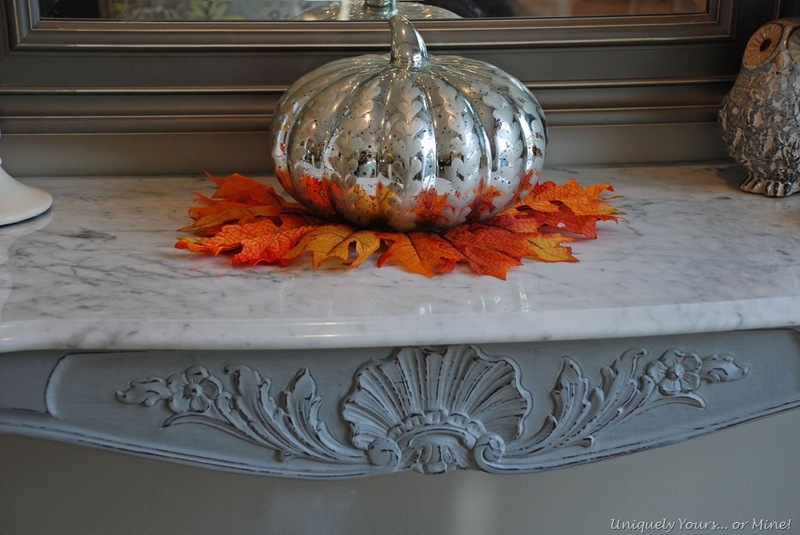 The Paris Grey is a perfect compliment to the Carrera Marble top! 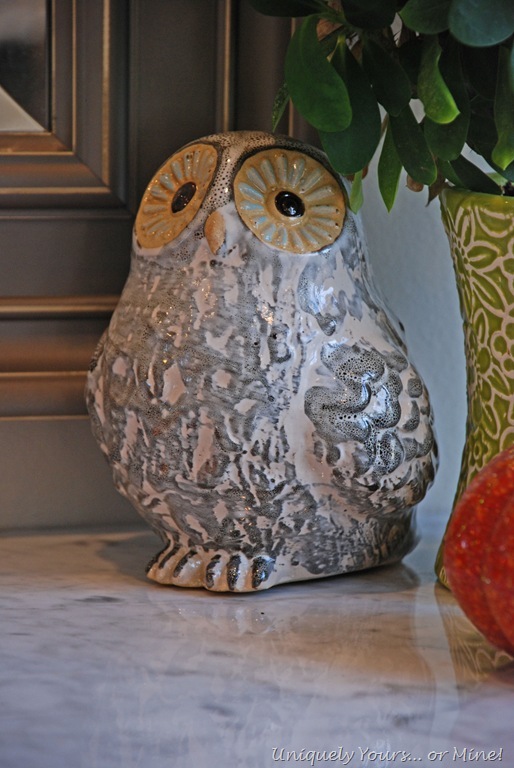 I just love this cute little grey owl I picked up from Hobby Lobby! The legs are just gorgeous! It is just the perfect display table! I hope you like my latest furniture makeover! I LOVE it! The cool gray looks so much better than the mahogany with the cool marble. What a great table. Oh my! The change is so dramatic! What a beautiful combo of colors in the blue and the marble. I am absolutely in love with it! FAbulous! I have grey cultured marble in the upstairs baths (which I detest but am stuck with for now) and I looked and this and thought, hmmm — wonder if that would help the looks of those baths? Maybe? I think it would look beautiful! It’s worth a try at least! This is just the inspiration I need with a make~over I’m planning in my Art Studio!!! What an amazing result! 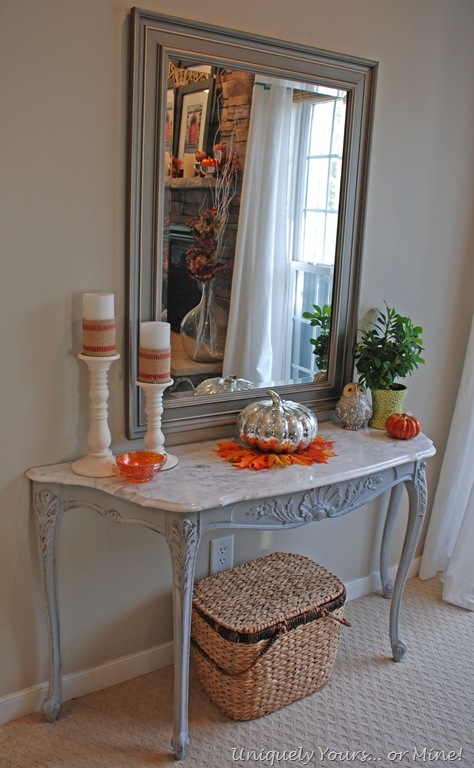 This little table looks fabulous in your entry!!! Visiting from Marty’s Table Top Tuesday! oh i am in love! what a beauty! the paint really makes those details pop- it looks like it was always meant to be this way. 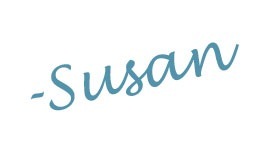 Susan that is a beauty now! Thanx for linking up to THT! What a difference! Love the grey! 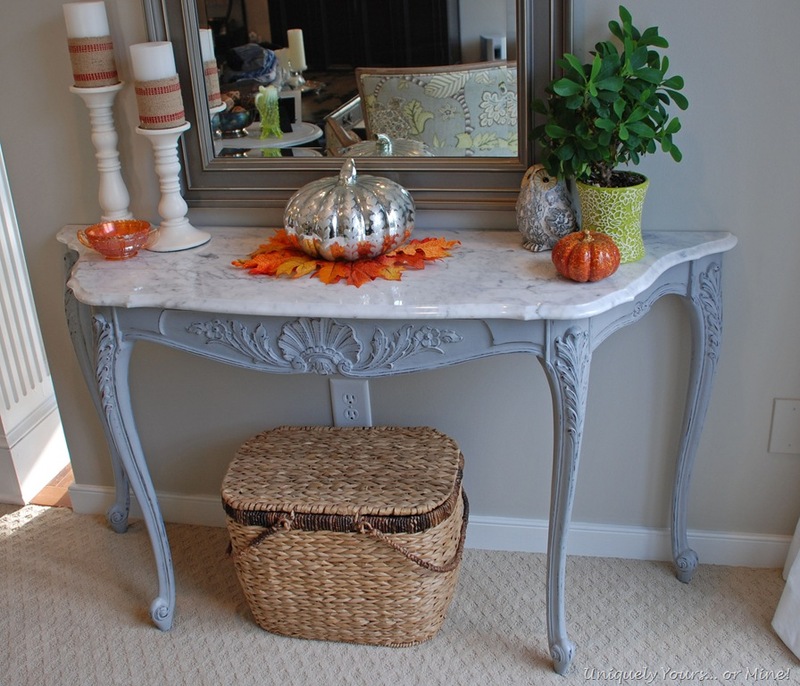 Visiting from MaryAnn’s blog, Power of Paint. 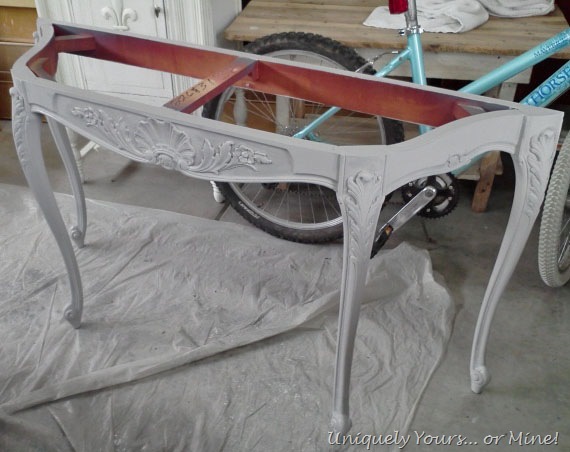 You couldn’t have chosen a more perfect color to go with the carrera – what a stunning piece of furniture you created!!! 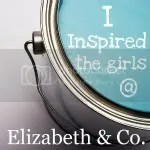 What a wonderful makeover – fabulous. I just read your bio and you and I could be good friends! Love what your doing. 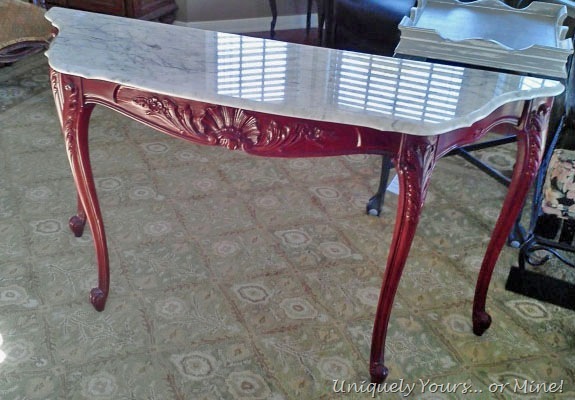 Stunning piece – I love the marble top too – in fact I love creating ‘faux’ marble – have you ever tried creating any? 🙂 – you could have a look at my website if you wish. Unfortunately, I don’t have a blog. http://www.decorativeideas.co.uk – not sure if I’m allowed to put my website details on here, but will understand if you have to delete it. Thanks so much Denise for all of your sweet comments! I’ll stop by your website today too!